After I chose the first songs for the album among the many I received, I found a strange connection in their lyrics. A certain story popped up from the songs. Some key words appeared in more than one song and some of the songs exposed a sort of different characters in their lyrics. With few changes, nearly every song seemed to fit this story very nicely. At the same time, the story is very vague and the songs are still not connected with each other in any way. You can listen any of the songs out of the album and it will make sense on its own. But at the beginning it was easier to focus in the red line going through the album and was very inspiring for the kind of sound that I was looking for in every song. Also it helped me to create new songs for the album since I had a nice story in my head already from the beginning. This is a song about living every moment of your life fully. Is a fight song without any swords or blood. A fight to do what you want to do in your life, in a way that if you die tomorrow, you die alive. Not like many people that are already dead while they are still living. Jim Dooley added the feeling of a movie trailer in the middle part of the song. This was composed in Ibiza together with Michelle and Kiko. I wanted to have a heavier song in the album with more operatic vocals. It took some days to come up with this song and in the end the song has 74 tracks of vocals! I had a lot of fun in creating harmonies and strange sounds with my voice. Mel Wesson added more power to the song with his crazy sounds. The story in the lyrics is beautiful, even though the music itself is really massive. We definitely like Rammstein and as homage I sang the line “my soul burns” that you would find familiar if you follow the band. I received the song when the band was nearly done with the recordings of the album in Ireland. I heard it and immediately loved it. It fits perfectly to the complete sound and idea of the album with its orchestral and choir arrangements, spooky mood and gorgeous melodies. This was one of the few songs that I didn’t change at all, which is quite amazing considering that I received it so late. I have been asked already what means Minor Heaven. I don’t think this question has an answer. MH is what you want it to be. I fell in love with the melody and I imagined the song as one of the beautiful lieds that I have been performing in my classical concerts. I asked my dear friend Izumi to play piano to reinforce that idea of mine. The song evolves into a bigger sound with orchestra and guitars and I do like the combination of them very much. In my career I have performed several great ballads. I love ballads and I was looking for a song where I could feel myself free and flow with the music. Anders and Mattias played me an amazing melody and I added my touch to some parts of the song. We wrote the lyrics with Hanne during beautiful sunrises in Ibiza. It started as a love song…but I cannot say where it ended. The song represents the dark spirit of the album. BATG grows little by little in an unexpected way that becomes massive and mind blowing. It has a strange and mysterious story in its lyrics. Music flows like in a musical. Is the best companion to Sing For Me. Like two parts of a same song, both in music and lyrics. This Alice Cooper classic is still very much played in the rock radios in Finland. The lyrics are very funny if you consider a woman singing them. I cannot reveal myself as a die-hard fan from Alice Cooper, but I always liked this one and it also brings me back to my years as a teenager. We did quite many backing vocals in the studio with my friend Tea, my brother Toni and Daniel, the producer of the album. The original song has already a huge amount of backing vocals and it definitely took some time to get them done. 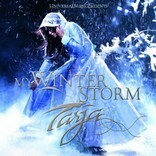 We produced the song to fit to the complete picture and sound of My Winter Storm. Mel Wesson did amazing ambience sounds and Alex, Doug, Earl, Torsten and Daniel were working very hard in the studio to make it sound fresh, but faithful to the original at the same time. When I received this song I liked that is was different than the others. It has a waltz structure what it is unusual for a rock song. It took for everybody until the complete song was close to be ready to finally understand it. Now is among everybody’s favourites. I am absolutely happy with the result. Mel Wesson and Jim Dooley, once again, did an outstanding job in this one! Still is a hard song to explain in words. You need to listen to it. This song was among the first ones I received. The song is inspired by a theme from Mozart’s Requiem. I immediately thought this song could match perfectly my identity and personality as a singer, having a background in classical music. It was hard to decide the final direction that the song should take. We started to make some experiments in the studio with a version having more guitars and another one with more orchestra. The original idea was to choose one of them, but in the end I liked both so much that when the record company suggested IWA as the first single, they saved my day! We are releasing those 2 versions as 2 separate singles so that I won’t need to choose. Is the only song I composed alone for the album. I felt the song name “Oasis” very strongly as the picture I tried to paint. Even though I wrote Finnish lyrics for the song, I decided to keep the original name. The feelings and emotions are the most important components of this song. Oasis tells about inner freedom, happiness and peace. Every one of us should be able to find that peace of mind when needed. MWS is an album that will drive you through different emotions. Atmosphere is dark and strong so I was looking for a quiet outro for the album. A piece of music that allows you to relax and leaves you with a pleasant mood. I thought that an acoustic guitar song was the best thing to do. When we were in Ibiza arranging other songs I told everybody about this idea. Immediately and very spontaneously we started to jam with an acoustic guitar with Kiko and Michelle. A couple of days later the song was ready and it didn’t change much from those days to the final recordings. I am happy to have Kiko Loureiro (to have 2 Kiko’s involved in the same song is already unusual) playing acoustic guitar. He gives definitely an additional flavour that I was looking for and a marvellous ending for MWS. This song was created by Torsten Stenzel, Angela Heldmann, Adrian Zagoritis and me. They made a demo of a basic track, which they showed to me. Usually I need some time for a song to grow in me, but this case was different. I felt the song strong. I added the vocal melodies and suggested few changes in the lyrics. It feels that D&D has been taken from a vampires’ movie. Dark, sad, gentle and beauty. When we started to work the song in the studio with Daniel and the band, everybody loved the song and wanted to take part of it. We ended up making two versions of D&D and producing them as different songs. Quiet and beautiful atmospheres that can be heard in certain film music inspired this song. I met Torsten Stenzel in Ibiza to discuss some ideas for a song he sent me for my new album. I immediately felt a strong connection between us so I asked him to play keyboards on My Winter Storm album. I played some soundtracks I love, for him and explained what kind of mood I was looking for. We ended up composing 2 new songs together; The Reign is one of them. My first approach for this song was to have it as an instrumental for the album. When Torsten presented his first ideas, we thought of using my voice as an instrument, without any lyrics. I sang some vocal melodies with that in mind. After we recorded the first demo of the song, it became apparent to us that The Reign should also tell a story. Together with Angela Heldmann and Adrian Zagoritis, I ended up writing the dreamy lyrics for it around a story I already had in my mind. It is fair to say that The Reign was partially inspired by Paulo Coelho’s book “The Alchemist”. The Wonderful Martin Tillman played the beautiful cello parts. For my Winter Storm album, we recorded the drums, bass and guitars in Ireland. Having had such a great time, I wanted to capture musically, the essence of my experience. This is the only song we composed in Ireland. It was amazing to see Doug Wimbish and Alex Scholpp jamming every day between the albums recordings. I loved some of the guitar riffs from those moments, and asked Alex to record them for me. I wanted to have a song to head-bang on stage! Ciarán’s well was born in a very spontaneous way. The name refers to one of the hundreds of Holy wells from Ireland. One in particular that was near our studio and holds many magical stories. It was actually very hard for me to include my own personality in this song. I wanted this song not to be too ambitious, a bit funny, and even at times, crazy. Something that can put a smile on your face. So I asked Michelle Leonard to give me a hand. Michelle and I did two other songs together for my winter storm. It was a lot of fun to write the lyrics and vocal melodies with her in the middle of the night in a hotel room in Hamburg, and I think everything worked out wonderfully!